Roman amphorae from a late Roman shipwreck in South Prasonisi islet, Greece, surrounded by seagrass meadows. With the help of me and colleagues around the world, the documentary explores seaweed’s enormous potential to reduce greenhouse gases and draw CO₂ out of the atmosphere. 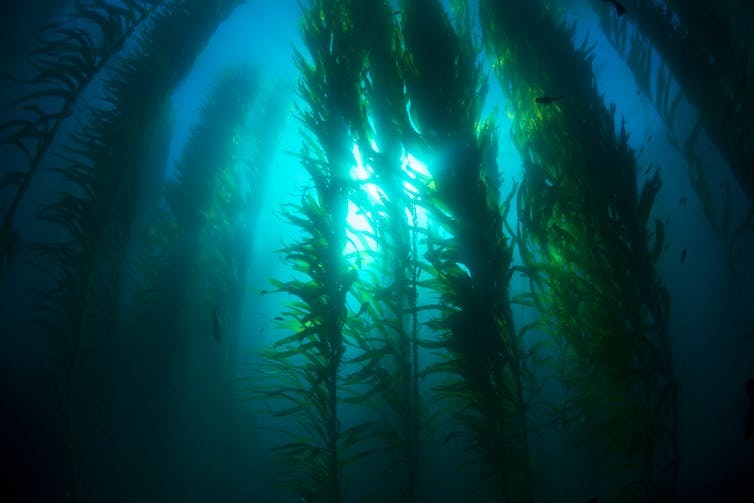 In the case of seaweed, that could include giant kelp farms that de-acidify oceans, or feeding algae to cattle and sheep to dramatically reduce their methane emissions. But while these possibilities are exciting, early adopters are dealing with unproven technology and complex international treaties. Globally, emissions are likely to keep rising, which means seaweed-related carbon capture should only be one part of a bigger emissions reduction picture. To stay within the Paris climate agreement’s 2℃ warming threshold, most experts agree that we must remove carbon from the atmosphere as well as reduce emissions. Many scientists now argue that 2℃ will still cause dangerous climate change, and an upper limit of 1.5℃ warming by 2100 is much safer. To achieve that goal, humanity must begin reducing global emissions from 2020 (in less time than it takes an undergrad enrolling now to finish their degree) and rapidly decarbonise to zero net emissions by 2050. Zero net carbon emissions can come from radical emissions reductions, and massive geoengineering projects. But it could be vastly helped by what Flannery calls “the third way”: mimicking or strengthening Earth’s own methods of carbon capture. Studies support the need to remove carbon from the atmosphere, but there are serious technical, economic and political issues with many large-scale plans. On the other hand, seaweed solutions could be put to work in the biologically desert-like “doldrums” of the ocean, and have positive side effects such as helping to clear up the giant ocean rubbish patches. However, there are many technical problems still to be solved to make this a reality. Removing carbon from the atmosphere is an attractive proposition, but we can’t ignore the emissions we’re currently pumping out. For any negative emissions technology to work, our global emissions from fossil fuels must start to drop significantly, and very soon. But wait a second, haven’t we already hit peak emissions? It’s true that for the third year in a row, global carbon dioxide emissions from fossil fuels and industry have barely grown, while the global economy has continued to grow strongly. This is great news, but the slowdown in emissions growth has been driven primarily by China, alongside the United States, and a general decline of emissions in developed countries. China’s reductions are impressive. The country peaked in coal consumption in 2014, and tends to under-promise and over-deliver on emissions reductions. However, under the Paris agreement, China has committed to a 60-65% reduction in emissions intensity, which means there’s still room for them to rise in the future. India’s emissions, on the other hand, are major wild card. With a population of 1.3 billion and rising, about 300 million of whom are still not connected to an electrical grid, and potential increases in coal use to provide energy, India will be vital to stabilising greenhouse gases. India’s emissions today match those of China in 1990. A study that combined India’s Paris agreement targets with OECD estimates about its long-term economic growth, suggested India’s CO₂ emissions could still grow significantly by 2030 (although per capita emissions would still be well below China and the US). So how do we deal with many competing and interconnected issues? Ideally, we need an array of solutions, with complementary waves of technology handling different problems. Clearly the first wave, the clean energy transition, is well under way. Solar installations are breaking records, with an extra 75 gigawatts added to our global capacity in 2016, up from 51 gigawatts installed in 2015. But this still represents just 1.8% of total global electricity demand. In addition to renewable energy generation, limiting warming to below 1.5°C also means we must increase the efficiency of our existing grid. Fortunately, early-stage financiers and entrepreneurs are focusing on a second wave of smart energy, which includes efficiency and optimisation technologies. Others in Australia have also noted the opportunities offered by the increasing use of using small, smart devices connected to the internet that respond to user demand. Although early user results have been mixed, research shows better system control reduces the emissions intensity of energy generation. These energy efficient devices and optimisation software are on the cusp of becoming widely commercially available. Critically, these efficiency technologies will be needed to complement structural change in the fossil fuel energy mix. This is especially in places where emissions are set to grow significantly, like India. Building renewable energy capacity, optimising with new software and technologies, and better understanding the opportunity for net negative emissions all play an important part in the emissions reductions relay race over the next 50 years to get us to 1.5°C. 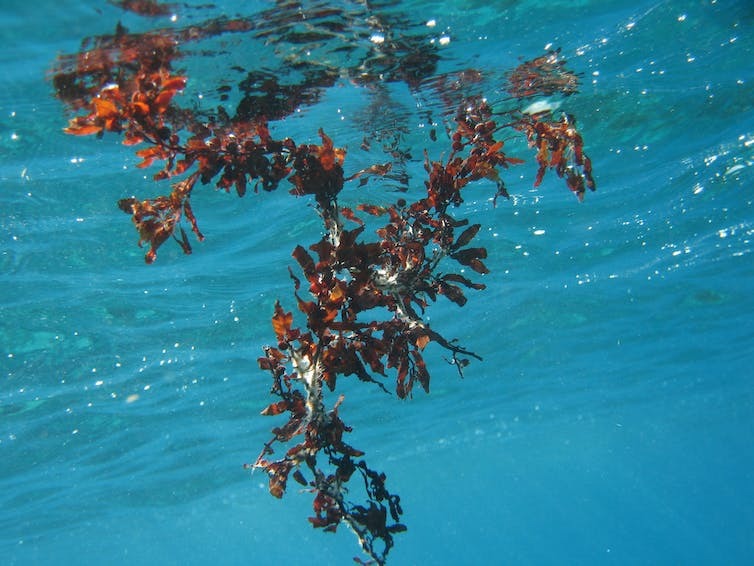 With further research, development, and commercialisation, the possibilities offered by seaweed – outlined in more detail in the Catalyst documentary – are potentially game-changing. But, as we saw with the development of renewable energy generation technology, it takes a long time to move from a good idea to wide implementation. We must support the scientists and entrepreneurs exploring zero-carbon innovations – and see if seaweed really can save the world. Can Seaweed Save the World? airs on the ABC on Tuesday 22 August at 8.30pm. 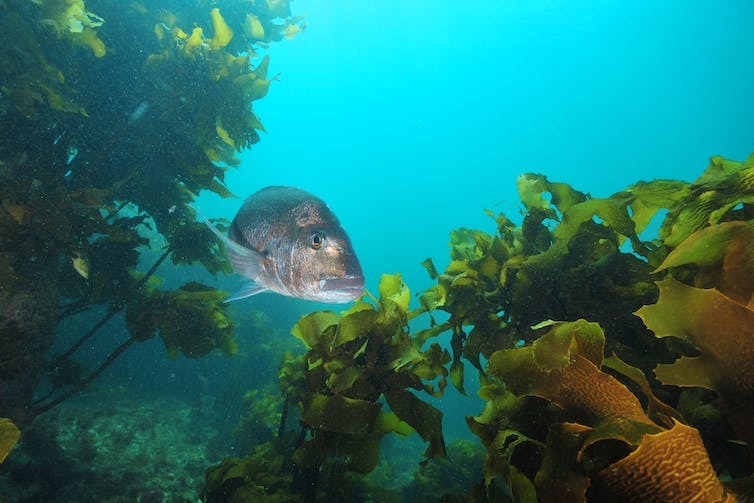 Giant kelp can grow up to 60cm a day, given the right conditions. now runs a profitable business. The following link is to an article that looks at how much carbon is stored by seagrasses.